that got its start at the Montpelier farmers market 10 years ago with the now-viral, still-handmade t-shirts. (The biz is currently enduring the wrath of Chick-fil-A, which believes “Eat More Kale” sounds too much like “Eat Mor Chikin.” Learn more and buy your shirts and stickers at www.eatmorekale.com.) But Eat More Kale is more than a cute t-shirt with a compelling story, it’s the coming of age for one of the best vegetables on the planet. My obsession with kale began almost two decades ago when I began learning how to eat these strange things called vegetables. Each week I widened my pallet with a new vegetable to throw into soup or put on pizza until my taste buds adapted to the new, green, mineral-rich flavors. Kale quickly climbed to the top of my favorites list. Why kale? I knew from working at Natural Health magazine that kale is *the* superstar in terms of nutrients and antioxidant density. But, more than that, it’s one of the most delicious, easy-to-prepare health foods, able to be grown in New Hampshire year-round (with the help of season extenders like hoop houses and cold frames), and extremely affordable. People who claim that healthy food costs too much haven’t compared the price of kale to a bag of potato chips. 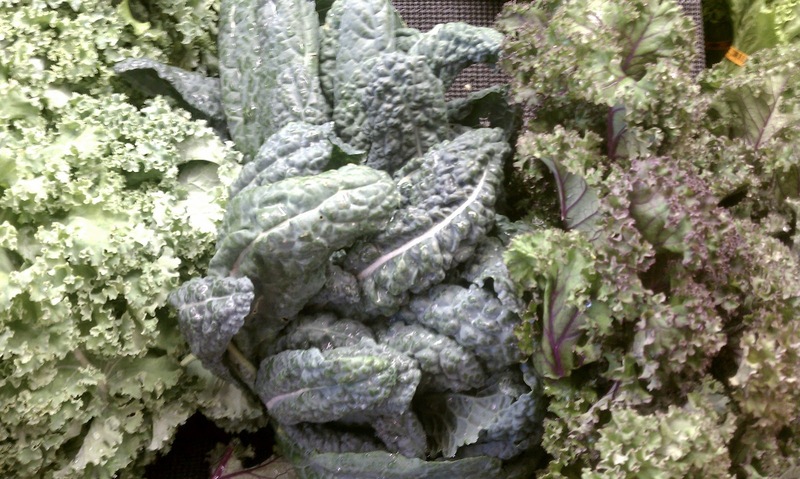 If you’re a kale skeptic, start your future obsession with lacinato kale, also known as dinosaur kale, Tuscan kale, black cabbage, and nero di Toscana. In a recent survey of organic growers in New Hampshire, this variety of kale was the absolute favorite amongst farmers and backyard gardeners in terms of productivity and popularity compared to any other type of produce. The leaves are a beautiful, bumpy, verdant shade of emerald, and it keeps a tad better than some other varieties in the fridge. The flavor is milder and texture more pleasant, lending itself well to sautes, green smoothies, kale chips, tacos, egg scrambles, pizzas, stir fries, and other recipes. That said, any bunch of kale will do, and particularly lovely bunches of red Russian and other varieties often find their way into my kitchen. Perhaps it’s the stems that are holding you back? While they are technically edible, most chefs remove the tough ribs for faster cooking and better flavor. You can trim them out with a knife, but I simply hold each leaf of kale stem-up and strip my fingers down the stem to pull off the tender leaves. Within just a minute or two, your whole bunch is ready to cook. Don’t be shy: Use that whole bunch in your recipe (or maybe two) – it cooks down quickly, and, let’s face it, we could all use a little extra green in our lives. Here's my latest, greatest kale recipe. What's YOUR favorite way to use kale? Let us know in the "Comments" section! 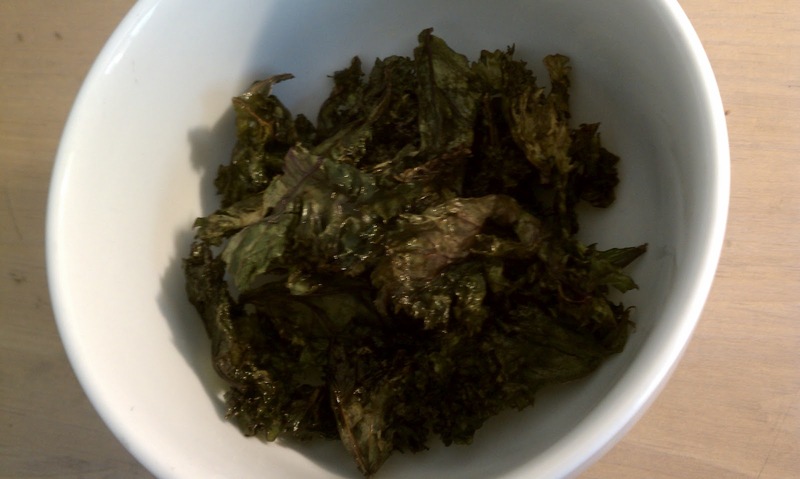 Kale Chips don't last long at our house! These are all the rage right now, and homemade is much less expensive and even tastier than pre-packaged because they’re wonderful still warm from the oven. Preheat the oven to 325°F. Prep kale, and lay it on a large cookie sheet. Pour olive oil over the kale, and rub it into the leaves. Sprinkle with salt and pepper. Bake, tossing every 10 minutes, until they are crispy, about 20 minutes. Watch to be sure you don’t burn them! When they are almost done, sprinkle them with spices and/or Parmesan, if using.